The terms 'EcoSensual,' 'us,' or 'we' refers to the owner of the website. The term 'you' refers to the user or viewer of our website. Your use of this website and any dispute arising out of such use of the website is subject to the laws of Hawaii, USA. The medical information on this website is provided without any representations or warranties, express or implied. Without prejudice to the generality of the foregoing paragraph, we do not warrant that: (a) the medical information on this website will be constantly available, or available at all; or (b) the medical information on this website is complete, true, accurate, up-to-date, or non-misleading. You must not rely on the information on this website as an alternative to medical advice from your doctor or another professional healthcare provider. If you have any specific questions about any medical matter you should consult your doctor or another professional healthcare provider. If you think you may be suffering from any medical condition, you should seek immediate medical attention. You should never delay seeking medical advice, disregard medical advice, or discontinue medical treatment because of information on this website. "I understand that if I use any of the methods described, I am using them of my own free will. In addition, I am aware that many of these methods have never been tested scientifically. 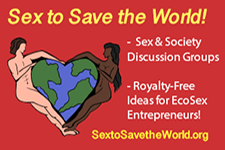 By purchasing access to this site I agree that I do not hold Ecosensual.org responsible for the success or failure of these methods, as well as for any side effects that may occur."